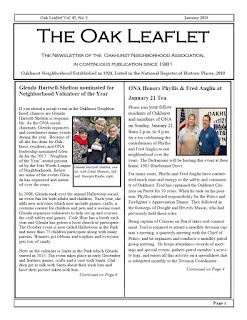 Oakhurst neighbors, check out this month's issue of The Oak Leaflet online! Inside are details on Glenda Hartsell-Shelton's nomination for the 2017 "Neighbor of the Year" award, as well as info on ONA's upcoming tribute to Phyllis and Fred Anglin for all of their contributions to the neighborhood over the years. Of course, you'll also find Elizabeth's President's Column, a calendar of upcoming events, Fred's (final?) COPS report, a recap of ONA's holiday decorating contest (see all the pics here), and more! Oakhurst Mural at Cook Children's Hospital!